For the past forty years, Westerners have been rediscovering the power of sound healing. Sound has been a primary method of healing used by various cultures for thousands of years. In South America, we call sound healing “Icaros,” which is primarily done through songs and chants to dispel illness. In India, sacred Mantras are used to induce deep meditative states. In fact, the discovery that sound is a powerful healer was understood all the way back in Ancient Greece when Pythagoras uncovered the power of vibration to heal. Tibetan singing bowls, tuning forks, crystal bowls, drumming and vocal “toning” are just some examples of sound being used to heal emotional and physical illness. Using sound has been proven over and over again to be a powerful way to restore harmony to the body. The mythologies and ancient stories of many cultures illustrate that matter and life originally formed through sounds and words, e.g. from the Christian God’s utterance “Let there be light,” to the Celtic belief in the “Òran mór” or the “Great Melody of Life” which encapsulates everything in life. When I chant songs and play instruments I know that sound serves as a funnel of “light” or a direction that guides the healing process through conscious awareness. In Shamanism we use music and dance to set aside the ego, to become spacious so that Spirit may work through us. To create this open space, traditionally we must sing and dance for hours, to the point of exhaustion so that our “mental chatter” quietens down before we begin any journeying or healing work. There are a number of ways to start incorporating sound healing into your life. You may wish to fill your life and sanctuary with the mysterious sounds of soul-stirring music. World, classical, and ambient music are all examples of musical genres that help us awaken to other worlds, unblock old wounds, and arouses deep emotions that help you to access your truth. Impermanence is the understanding and experience that life is constantly changing; nothing is “permanent” or stays static. Impermanence is really something that has to be experienced, in the moment, to be appreciated. When everything is understood as impermanent, greater wisdom, peace, and loving kindness is unlocked within us. Engaging with your own sound healing instruments each day also allows you to enter a state of “flow” in which you can truly absorb yourself into the moment. This absorption makes us aware of the absence of separation between ourselves and existence; the underlying silence beneath every sound, that eternal nothingness that is pregnant with the possibility, and that the only true constant in life is change. Singing bowls are perhaps the most popular sound healing instrument out there. 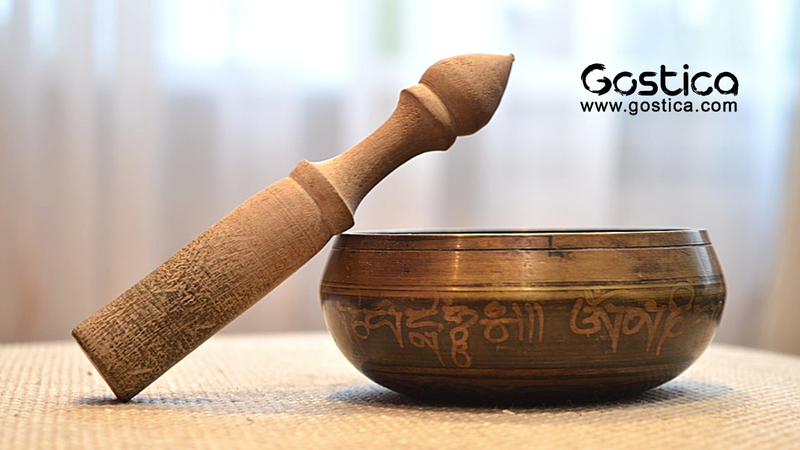 Singing bowls are most commonly used in yoga, personal rituals, sound therapy practices, and religious ceremonies. In the Buddhist tradition, they are played to signal the beginning and the end of silent meditation cycles; like a bridge back and forth between internal and external conscious realms. These cymbals create a hauntingly beautiful sound, especially during chanting. Tibetan Buddhism has much of its history rooted in shamanism, and due to this, Tingsha cymbals are often used in ritual practice to establish harmony with the nature spirits of the environment. You will often hear Tingsha cymbals during tantric offering rituals as well. In Buddhism, the gong is sounded at the start and end of each day. In Chinese temples, gongs are struck 108 times because it’s believed that sentient beings have 108 types of worries. This practice is based on the philosophy that upon hearing the gong, a person’s worries will cease and wisdom will grow. Nothing has the ability to transport one to another time and place like the powerful resonance of a gong. Gongs were traditionally sounded to chase away evil spirits, warn of invading armies, heal the sick and invoke the spirits of the dead. These days, the gong’s deeply reverberating sound helps to awaken the mind and instill full-body peace. The purpose of this bell is to awaken you to the present moment. You can hit the bell with a wooden mallet, or you can simply ring it. Appropriately, “Dorje” means thunderbolt in Tibetan because it’s like a shock of electricity that surges into your consciousness in order to quiet the mind. This bell is also sometimes described as a diamond scepter and is a sacred symbol of wisdom. People use it in meditation, holding it in one hand in a mudra position. The bell and dorje together represent feminine (bell) and masculine (dorje). Although not technically an instrument, in Buddhism wind chimes and wind bells have played a significant role in various rituals and were thought to attract peaceful spirits while protecting against evil forces. The chimes were hung in large numbers on temples, shrines, pagodas, and caves causing one to awaken to the beauty of the present moment during breezes. Wind chimes are one of my favorite ways to spontaneously feel a sense of connection to nature and life. It can be hard to maintain a state of mindful awareness when our being is divided in concentration and our present moments are interrupted constantly by thoughts and worries. If you’ve ever heard the chanting of the familiar Om or Aum Mantras, you will know what I mean. You can even use one of those two Mantras if you prefer that to the vowel sounds. Try this toning exercise and observe how it affects your state of consciousness and physical well-being. By doing so you’re combing the healing of both light (of consciousness awareness) and sound (vibration). Few people truly understand the power of that constitutes each and every Soul. We think that when we feel the vibrations and harmonies of beautiful instruments like bowls, drums, bells, or flutes it is through our ears. The reality is that we hear the sounds with our ears, but we feel the music with our Souls.